Escape at Over 65 Miles per Hour! You've shot zombies. You've run from zombies. You've even used plants against zombies. 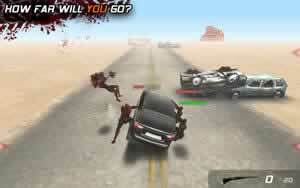 In Zombie Highway, you're going to be dealing with zombies using the all American automobile. Congratulations! You have accomplished what hardly anyone in a zombie apocalypse has done: secured a working vehicle and got out of the city. However, your survival is still far from guaranteed. As you drive down the road, zombies will latch onto your car with inhuman strength and try to get at the tasty gray matter within your skull. Don't let them! Show these freeloaders precisely why the road belongs to the living. The 9mm handgun. It may not pack a lot of punch, but it's better than nothing and has a lot of ammo. The M-SMG. 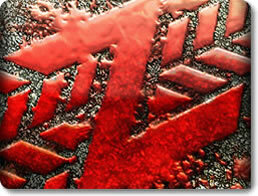 Fill the undead's soft bodies with a hail of bullets. Zombies come in all shapes and sizes. You'll have to hone your driving techniques and shooting skills tactfully if you want to kill them all. Watch out for the following undead fiends. Regenerators heal over time if you don't get rid of them fast enough. 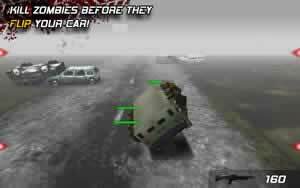 Zombie Highway is a fast and addictive app that seamlessly combines aspects of the infinite runner with the always popular zombie killer. What's not to love about it? It's speedy, it's funny, it's challenging, and it has nearly endless replay value.